You’ve seen this classic Ray Gaddis moment. He finds a combination with a midfielder and, through his speed and agility, suddenly finds himself at the corner of the 18. Every time it happens, there is a fraction of a second, when his bend-over stance freezes, and for tiny bit of time, everything comes to a standstill. Gaddis takes a breath and a few rays of sunlight. In his head, he is running the numbers like an Atlantic City casino accountant anticipating a large payout. He knows very well what he wants to do. He is a soccer player, and a man, and wants to score. But he’s also a rational thinking human being who reads the Bible before bed, but also admires philosophy because he enjoys thinking. In that one moment, he knows he can make a sneaky thought-out move and glory may fall upon him, but he gives himself a meager 20 percent success rate. Meanwhile, a pass to one of the more expert finishers will be far more likely to get to the goal. We’ve all seen Gaddis at his best. “Gaddis Island,” as Union head coach Jim Curtin used to call it, is the place where wingers go to get shut down. 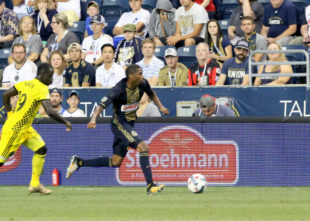 We’ve seen him struggle too, as he did in the U.S. Open Cup final, when he went out to play, clearly injured, and gamely tried to shut down perhaps the league’s most explosive winger in Alberth Elis. No matter what, we get the same: A humble, hard-working veteran who goes out and does his best, no matter the circumstances. Teams should consist of characters, not cookie-cutter “yessir” athletes who don’t have their own personalities. The wider the array of personalities, the better a team becomes. Heterogeneous communities generally thrive better than homogeneous communities. You feed off each others’ insights, ideas and experiences. The personalities in the team form the foundation on which other people thrive, and Ray right now is one of the Union’s rocks. The biblical reference is not a coincidence because we all know Gaddis stands out among his team for loving and practicing his religion. He can’t wait to spread to good word after the shrieking sound of the last whistle dies away in the cheering crowds. Gaddis constantly talks during the game to motivate and warn the guys on the line for approaching attackers. You can hear him say things like, “Play hard but keep it legal!” In other words, do we take a nasty foul to prevent a goal, or do we try to resolve a breakaway situation sweeper-style, a hard but fair tackle? There was another Ray Gaddis moment on Sep. 15. After he made a bad pass against Montreal, Ignacio Piatti said, Thank you, and was off towards the other half of the field. Gaddis didn’t waste a breath or a thought. He just sprinted back and found the exact right angle to catch up with Piatti in a matter of seconds. Right then, when they were shoulder to shoulder, Gaddis knew he could foul Piatti, who expected to be taken down at this moment. But the Union were up one goal, the stakes were slightly lower, and there was this one moment of hesitation in his thinking. The hard tackle stayed in his back pocket, and Piatti toe-poked it to Alejandro Silva, who finished by passing Blake. It seemed Gaddis decided to avoid making a card-promising and potentially injury-inducing foul, thereby choosing the game over the win. This isolated moment in the game is evidence of another admirable decision by Ray Gaddis. Gaddis is bigger than the game. He is a man with a mission as delivered in Colossians 3:17: Fair play matters. He has a faithful following, and he wants to set an example for the young kids who admire him. It’s a higher standard with a simple premise. You play hard, but you play the game the right way. Thanks for this. I admire the man and his faith. lmao, only took one day for the ray gaddis post.